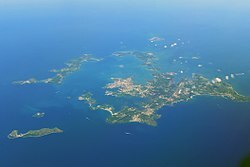 The Penghu (Hokkien POJ: Phîⁿ-ô͘ or Phêⁿ-ô͘ ) or Pescadores Islands are an archipelago of 90 islands and islets in the Taiwan Strait. The largest city is Magong, located on the largest island, which is also named Magong. 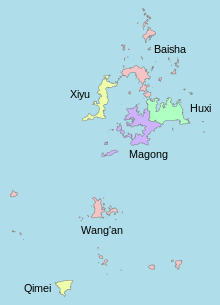 Covering an area of 141 square kilometers (54 sq mi), the archipelago collectively forms Penghu County of the Republic of China (Taiwan), and is the second smallest county, after Lienchiang. The traditional name of the islands, the Pescadores, comes from the Portuguese name Ilhas dos Pescadores ("Fishermen Islands"). The Modern European Portuguese pronunciation is [pɨʃkɐˈðoɾɨʃ] but, in English, it is typically closer to Classical Portuguese's: /ˌpɛskəˈdɔːrɪz, -iːz/. The islands have also been called Pehoe from the Minnan name Phêⁿ-ô·. Wang Dayuan gave a detailed first-hand account of the islands in his Daoyi Zhilüe (1349). In the 15th century, the Ming ordered the evacuation of the islands as part of their maritime ban. When these restrictions were removed in the late 16th century, legal fishing communities were re-established on the islands. These fishermen worshipped at the Mazu Temple that gave Magong its name and themselves gave rise to the Portuguese and English name Pescadores. The Ming established a military presence in 1603. At this time, the Dutch East India Company was trying to force China to open a port in Fujian to Dutch trade and expel the Portuguese from Macau. When the Dutch were defeated by the Portuguese at the Battle of Macau in 1622, they seized Penghu, built a fort there, and threatened raids on Chinese ports and shipping unless the Chinese allowed trading with them on Penghu and that China not trade with Manila. In response, the Chinese governor of Fujian demanded that the Dutch withdraw from Penghu to Taiwan, where the Chinese would permit them to engage in trade. The Dutch continued to raid the Fujian coast between October 1622 and January 1624 to force their demands, but were unsuccessful. In 1624, the new governor of Fujian sent a fleet of 40–50 warships with 5,000 troops to Penghu and expelled the Dutch, who moved to Fort Zeelandia on Taiwan. 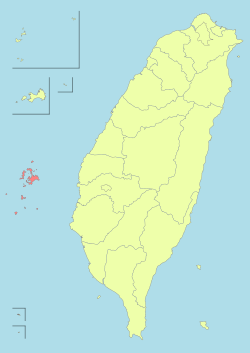 Penghu County was then called the Hōko Prefecture by the Japanese government of Taiwan. During World War II, Makō (Makung) was a major base for the Imperial Japanese Navy and the embarkation point for the invasion of the Philippines. In the Cairo Declaration of 1943, the United States, the United Kingdom and China stated it to be their purpose that "all the territories that Japan has stolen from the Chinese, such as Formosa and The Pescadores, shall be restored to the Republic of China". On 26 July 1945, the three governments issued the Potsdam Declaration, declaring that "the terms of the Cairo Declaration shall be carried out". However, the United States and the United Kingdom regard the aforementioned documents as merely wartime statements of intention with no binding force in law. Following the surrender of Japan on 2 September 1945, Supreme Commander of the Allied Powers Douglas MacArthur issued General Order No. 1, which directed Japanese forces to surrender to the Allied Powers and facilitate the occupation of Japanese territories by the Allied Powers. In the Treaty of San Francisco, signed in 1951 and coming into effect in 1952, Japan renounced sovereignty over Taiwan and Penghu, but left their final disposition unsettled. The archipelago has been administered by the Republic of China since 1945. Boat people from Vietnam who were taken in by Taiwan's ships in the South China Sea were sent to the Penghu. Lai Feng-wei, the incumbent Magistrate of Penghu County. Penghu County is administered by Penghu County Government headed by Magistrate Lai Feng-wei of the Kuomintang and headquartered at the Penghu County Hall. 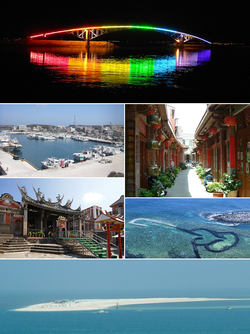 Penghu County is divided into 1 city and 5 rural townships. It is further divided into 97 villages. Like Lienchiang County, Penghu County has no urban townships. The county seat is located at Magong City where it houses the Penghu County Hall and Penghu County Council. The main islands of Magong City/Huxi Township, Baisha Township, and Xiyu Township are the three most populous islands and are connected via bridges. Two shorter bridges connect Huxi and Baisha. The Penghu Great Bridge connecting Baisha and Xiyu is the longest bridge in Taiwan. Due to its restricted geography, fisheries have been the main industry for Penghu. The Agriculture and Fisheries Bureau of the Penghu County Government governs matters related to agriculture and fisheries in Penghu. In 2016, the bureau placed a ban on the harvesting of sea urchins due to their declining population. However, the ban was lifted in 2017 but catches are limited only to those species larger than 8 cm (3.1 in) in diameter. Source: "Populations by city and country in Taiwan". Ministry of the Interior Population Census. May 2018. Education-related matters in Penghu County are administered under the Education Department of the Penghu County Government. The county houses the National Penghu University of Science and Technology. Penghu is powered by the Chienshan Power Plant, a 140 MW diesel-fired power plant commissioned in 2001, and the Hujing Power Plant on Table Island. On 24 December 2010, the Taiwan-Penghu Undersea Cable Project of Taipower was approved by the Executive Yuan to connect the electrical grid in Taiwan Island to Penghu. Under a wind power development project approved in 2002 by the Executive Yuan, the ROC government plans to set up a total of 200 wind turbines in Penghu within 10 years. However, only 14 turbines have been set up as of 2015[update]. On 1 October 2015, Taipower announced the construction of another 11 new wind turbines across the island, of which 6 will be constructed in Huxi Township and 5 in Baisha Township. The current total desalination capacity of the county to provide clean water to its residents is 15,500 m3 per day. To reduce its groundwater use, in November 2015 the county secured a contract of building an additional desalination plant with 4,000 m3 capacity per day, construction of which is expected to be completed by May 2018. The Penghu National Scenic Area was established in the early 1990s, comprising most of the islands and islets of the archipelago. Tourism has since become one of the main sources of income of the county. Historical sites include Central Street, Mazu Temple, Four-eyed Well, Penghu Reclamation Hall, Qimei Lighthouse, Siyu Eastern Fort, Jinguitou Fortress and Siyu Western Fort. Museums in the county are Chuwan Crab Museum, Ocean Resources Museum, Chang Yu-sheng Memorial Museum and Penghu Living Museum. Other attractions in the county include the Double-Heart of Stacked Stones, Little Taiwan, Whale Cave, Xiaomen Geology Gallery and South Penghu Marine National Park. Since 1 January 2015, tourists from Mainland China can directly apply for the Exit & Entry Permit upon arrival in Penghu. This privilege also applies to Kinmen and the Matsu Islands as a means to boost tourism in the outlying islands of Taiwan. Despite the size of the drug seizure, only the five crew members of the Chinese fishing boat were detained in the operation, with authorities “unable to find the Taiwanese ship which should have turned up to take delivery of the drugs”. It was unclear from media reports how the Taiwanese side of the smuggling operation knew to abort the rendezvous. The suppliers of the shipment also evaded capture. It was believed the drugs were destined to be transported from Penghu for distribution on Taiwan. Penghu is served by Magong Airport in Magong City and Qimei Airport in Qimei Township. Both airports opened in 1977. Daily Air Corporation operates flights between Penghu to Kaohsiung. Magong Harbor hosts ferry connections with Kaohsiung, Tainan, Chiayi and Kinmen. ^ Campbell, William (1903). "Explanatory Notes". Formosa under the Dutch: described from contemporary records, with explanatory notes and a bibliography of the island. London: Kegan Paul. p. 546. OCLC 644323041. ^ a b "Penghu Reclamation Hall". Archived from the original on 30 March 2012. Retrieved 22 December 2012. ^ a b Wills (2006), p. 86. ^ Thompson (1964), pp. 167–168. ^ Wills (2006), p. 87. ^ Wills (1998), pp. 368–369. ^ Wills (1998), p. 369. ^ Wills (2010), p. 70. ^ Loir (1886), pp. 291–317. ^ Takekoshi (1907), pp. 80–82. ^ KAMM, HENRY (5 August 1981). "DESPITE PERILS AFLOAT, VIETNAMESE CONTINUE TO FLEE". The New York Times. CAMP ONE MAKUNG, Pescadores, Aug. 1. ^ Chen, Chi-ching; Lin, Ko (11 May 2017). "Ban on sea urchin harvesting temporarily lifted in Penghu". Focus Taiwan. Retrieved 12 May 2017. ^ "Taiwan power company-Taipower Events". Archived from the original on 17 May 2014. Retrieved 3 June 2014. ^ "Taipower to help build Penghu into low-carbon county". ^ "Penghu chief seeks support for desalination plant expansion". ^ "Ferry service between Tainan and Penghu's Dongji kicks off | Society | FOCUS TAIWAN - CNA ENGLISH NEWS". ^ "Annual ridership on Kinmen-Fujian ferry services tops 1.5 million". Wills, John E., Jr. (1998). "Relations with maritime Europeans, 1514–1662". In Twitchett, Denis C.; Mote, Frederick W. (eds.). The Cambridge History of China: Volume 8, The Ming Dynasty, 1368–1644, Part 2. Cambridge University Press. pp. 333–375. ISBN 978-0-521-24333-9. —— (2006). "The Seventeenth-century Transformation: Taiwan under the Dutch and the Cheng Regime". In Rubinstein, Murray A. (ed.). Taiwan: A New History. M.E. Sharpe. pp. 84–106. ISBN 978-0-7656-1495-7. OL 8055024M. —— (2010). "Maritime Europe and the Ming". In Wills, John E., Jr. (ed.). China and Maritime Europe, 1500–1800: Trade, Settlement, Diplomacy, and Missions. Cambridge University Press. pp. 24–77. ISBN 978-0-521-43260-3. OL 24524224M. Wright, Arnold (1908). Cartwright, H. A. (ed.). Twentieth century impressions of Hongkong, Shanghai, and other treaty ports of China: their history, people, commerce, industries, and resources, Volume 1. Lloyds Greater Britain publishing company. OL 13518413M. Cook, Harold John (2007). Matters of Exchange: Commerce, Medicine, and Science in the Dutch Golden Age. Yale University Press. ISBN 978-0-300-13492-6. Deng, Gang (1999). Maritime Sector, Institutions, and Sea Power of Premodern China. Greenwood Publishing Group. ISBN 978-0-313-30712-6.